Pioneering medical anthropologist and lifelong communist Corinne Shear Wood died May 25 at age 84 in Santa Cruz, Calif., after a brief illness. Dr. Wood’s life wove together her commitment to social justice, medical research and interest in all things human. She authored a textbook on medical anthropology and numerous scientific articles. The daughter of Russian Jewish immigrants, Wood came of age politically during the early forties, when the U.S. joined the rest of the world in mobilizing against fascism. She took a job in a shipyard in her hometown of Baltimore. Deeply influenced by the militant union seamen on the waterfront she soon joined the Communist Party. The money she earned at her shipyard job allowed Wood to begin taking night classes at Johns Hopkins University. At that time, she recalled, women were barred from the campus except for extension courses on evenings and weekends. Digging into the medical sciences, Corinne became a technician working in research projects at Hopkins. At one point, Al Lannon, legendary Communist waterfront leader of longshoremen, asked Corinne to take on a special assignment. She hitchhiked down to Jacksonville, Fla. to help workers put out a mimeographed newsletter. She later told a story of being unnerved because she was followed everywhere by two burly men, one black and one white. When she confronted them they told her they had been assigned by Lannon to look after her in case of attack by company goons! After the war, it was over another mimeograph machine back in Baltimore that she made the acquaintance of a handsome young GI who had come to work as a millwright helper in Bethlehem Steel’s giant Sparrow’s Point complex. A whirlwind romance with Bill Wood led to marriage and four progeny: Carl, Bobbie, David and Gina. Niece Anita lived nearby and became a close part of the family after the death of her mother. Corinne and Bill were active day and night in peace, union and civil rights struggles even during the difficult circumstances of the McCarthy period. Corinne was even accused of “infiltrating” the PTA! When Bill was fired and blacklisted after refusing to testify before the House Un-American Activities Committee, the family moved to Riverside, Calif., where the couple helped form a club of the Communist Party and worked on peace, fair housing, school integration and union issues. Corinne found work in a local hospital as a medical technician and began her study of anthropology, graduating Phi Beta Kappa and earning a PhD after a year of study at Oxford. 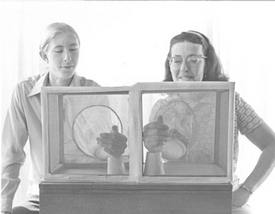 Twenty-four years of lab work formed the basis for her dissertation on mosquitoes and malaria. Wood’s studies took her to Samoa, Pakistan and New Zealand. She returned many times to New Zealand, working with indigenous people to establish clinics within the Marae (villages) which combined Maori traditional healing with Western medicine. She was active in her union and the Women’s International League for Peace and Freedom. Wood worked as professor of Anthropology at California State College at Fullerton and later at Cabrillo Community College in Santa Cruz. Her 1979 book, “Human Sickness and Health: A Biocultural View,” was one of the first anthropology textbooks to focus on women’s health issues. She was diagnosed with Alzheimer’s disease several years ago and felt compelled to quit teaching formally. To the very end of her life, however, she maintained her interest in people and the world, in learning and culture and her dry sense of humor. Wood was a lifelong devotee of the Peoples Weekly World, contributing occasional articles and letters and regular financial support. Her modest estate included a small sum to be designated for coverage of health care issues in that publication. Corinne is lovingly remembered by her children: Carl (Anne), Roberta (Scott Marshall), David (Dr. Jennifer Choate), and Gina Wood, Anita Martinez (Chris), sister, Rochelle Levin, 10 grandchildren and their spouses, one great grandchild plus two more on the way, and many nieces, nephews, colleagues and comrades. Donations in Corinne Wood’s memory can be made to the People’s Weekly World, 235 W. 23rd St., NY, NY 10011.